Welcome to Captain's Quarters Cottage on Salt Spring Island. 'Captain's Quarters' 850 square foot waterfront cottage located near Fulford Harbour, close to a nice park, 4 minutes to the BC Ferries terminal, and more beautiful things to experience. Step down to private beach across the road for kayaking and walking. The cottage has two bedroom with one king sized bed - one queen bed - and sofa bed in the living room with open wood fireplace (ideal for a family and kids - comfortable for 4 to 5 persons). Keywords: Nautical themed waterfront cottage with beach access on Fulford Harbour on Salt Spring Island. Two bedrooms cottage with barbecue and open wood fireplace. I bought 'Captain's Quarters' cottage as my weekend getaway in 2008. Since then, I fell in love with Salt Spring Island and purchased the property next door as my permanent residence. I am enjoying living on Salt Spring Island and hope my visitors will fall in love with Salt Spring Island too! 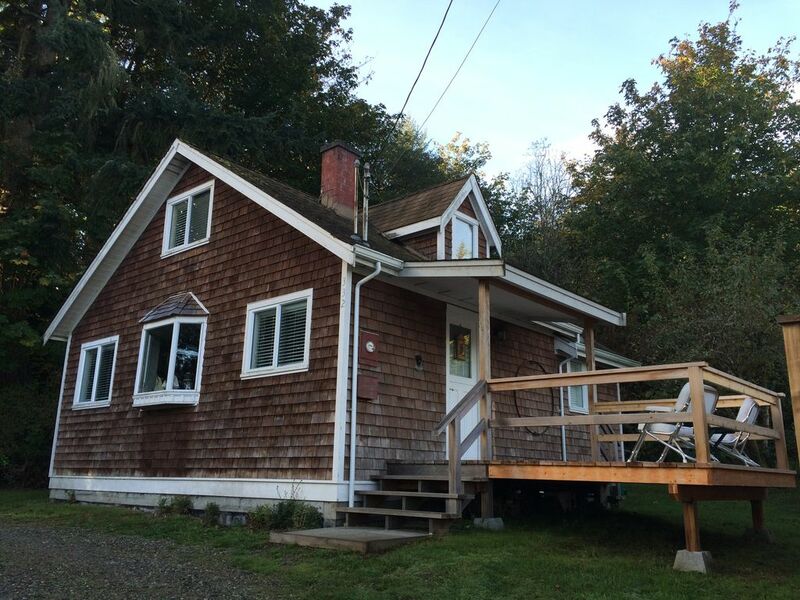 Great location with the beach access located on the beautiful south end of Salt Spring Island. Very quiet and peaceful in private location, yet minutes to town and other amenities. Watching a couple of 'Bald Eagles' on the tree in the front of the property. We have a full equipped bathroom with a nice vanity set and shower. Enjoy a quiet Fulford Harbour south end of the island village. Captain's Quarters Cottage located across the road from it private beach. Please enjoy the view from the cottage. Beautiful Fulford Harbour view from the cottage and the back deck of the cottage. Beautiful water view of Fulford Harbour. Enjoy Captain's Quarters waterfront front access for your morning and evening walk. Access to High-speed Internet and WIFI. Living room will seat at least 5 people. A small lawn on the side and back of the cottage. We would be happy to let our guest use our personal kayak. A nice size deck front and back with teak table and chairs. We provide a golf clubs for our guests that would like to golf. Stayed for 10 days for work while on the island. This place was great. It has everything you need. This place has everything you need to be comfortable while away from home. High speed internet. Washer and dryer. Full kitchen. And 2 big comfy beds with lots of pillows. 10 out of 10 would stay again. My wife and I had a great time staying in the Captain's Quarters on Salt Spring. The property was clean, and with the baseboard heaters and wood fireplace, we were always nice and warm inside. Will definitely return, and have recommended it to others! We went to Salt Spring with the hopes of unwinding and enjoying time both inside and outside. This cottage offered us a comfortable and cozy space to enjoy cooking, reading and settling in after being outside. The amenities were in good shape and the washer and dryer are a nice addition for our outdoor clothing! The kitchen was well stocked, the rooms were clean and everything worked well. When we ran out of firewood, a quick response by Razali and his friend brought us more. If you are interested in a quiet get away this is your place! It is slightly out of the way (fifteen minute drive from Ganges) so if you want to be in the hub of Salt Spring this location may seem removed for you. Captain's Quarters is in an excellent location across the road from the water. There are stunning views of the harbor and the mountain. It is quiet with everything you need for a weekend away. We were very happy with the accommodations and amenities in the cabin. We have stayed here several times, it is alway immaculately clean, well decorated, such a cute property... lovely host...would not hesitate to recommend it!! Such a cute house that had everything we needed for the weekend. Kayaking, cycling, studio tour, and Galleries. Cancellation Policy: Deposit is refundable with less $50 processing and administration fees at the time your cancellation or anytime you cancel the reservation. If cancelling within 30 days, you will be charged for the entire stay. Thank you for your understanding.